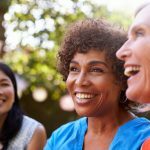 We recently had the awesome opportunity to interact with an inspiring group of amazing ladies when we hosted a health and wellness Q&A on the Well.ca Facebook page. During this fun hour, we did our best to answer your most pressing health and wellness goals. We were so impressed with the questions you asked us and we loved sharing our tips, tools and knowledge with you! 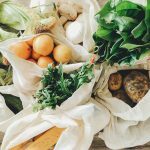 Not only did you inquire about our top tips to help you eat well on a budget (a topic we LOVE to chat about! 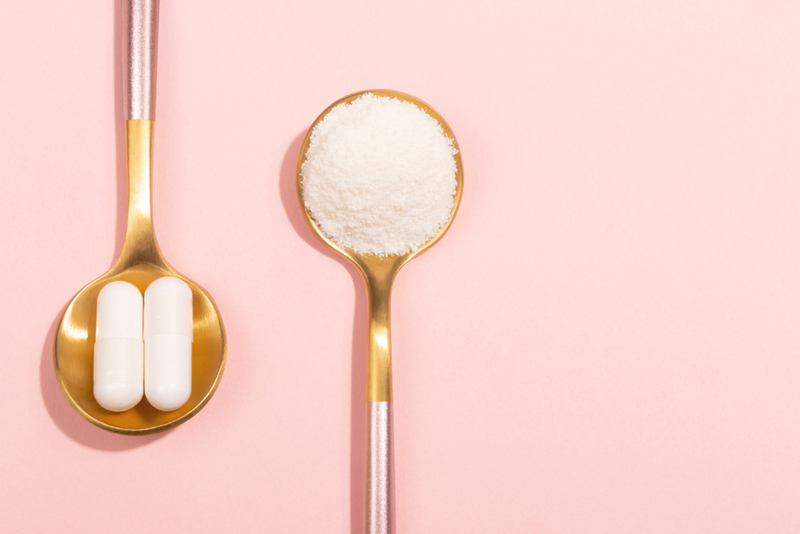 ), but also the best ways to bust sugar from your diet, our favourite supplements that’ll help boost and maintain your energy levels (especially important during the cold and dark winter months! ), and benefits of essential oils (one of 2017’s biggest health trends!). We had so much fun answering your questions that we’ve decided to round-up the top questions and answers here so you can have access to the information any time! How can I bust sugar from my diet? Take steps to reduce (or better yet, eliminate altogether) any soda, sugary beverages and even most vitamin-enhanced drinks. These contain loads of unnecessary sugar and will immediately cut how much sugar you consume daily. Avoid adding any extra sugar to coffee or tea. Give it a week and we promise you won’t even miss it. Boost your consumption of naturally sweet veggies (think squash, carrots and sweet potatoes). These are abundant in natural sugars which can help curb your sweet tooth. Increase your hydration by drinking more water, especially warm lemon water. Warm lemon water helps detoxify our body and liver and helps reduce sugar cravings. Avoid over-processed foods, which often have hidden and added sugars. Instead stick to whole unprocessed foods, including grains, nuts, seeds, lean proteins, fruits and veggies. Eat one to two squares of dark chocolate daily (containing at least 70% cacao). Dark chocolate is one of the most potent sources of antioxidants on the planet, and it can help reduce cravings for other sugary foods. Are there any vitamin supplements that can help boost my energy? We could all use an energy-boost, especially at this time of year. The first question we ask is are you taking a probiotic? 2017 has been called “The year of the GUT”, and for good reason. We know our gut health is essential to our overall health and wellbeing. If our gut is out of whack, we can feel sluggish and have less energy. For this reason, adding a daily probiotic to your supplement routine is something we highly recommend for everyone. Additionally, it’s also super important to consume a diet that is balanced and rich in vitamins and nutrients, most importantly antioxidant-rich foods. Up your consumption of green leafy veggies, berries, nuts and seeds and high-quality grains (think quinoa). 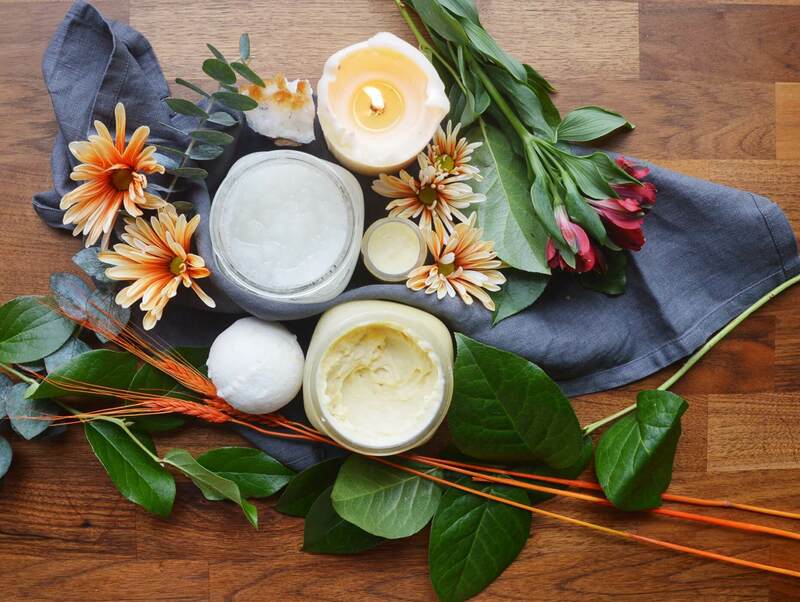 Where can I find information on the uses of essential oils? Visit your local health food store and inquire if they have someone on staff that is educated in this field. I live in Burlington, Not sure where to look? Try searching to see if there is an essential oils expert in the area you live, or ask someone at your local health food store. What are the best vitamins to help ward off colds and flu bugs? Many people believe products such as Cold-FX can help alleviate your cold and flu symptoms and they turn to them at the first sign of a sniffle. But, if you’re looking for other ways to keep a healthy and strong immune system, we believe you can achieve the same results by consuming a diet that is rich in antioxidants, vitamins and minerals. Oranges and apples are loaded with vitamin C which is essential for strengthening our bodies’ immune defence. Other key vitamins and minerals (vitamin D, B, E and Zinc) are also essential for optimal immune function and play an important role in keeping us healthy. Our advice for achieving a healthy, strong, powerhouse of an immune system is to eat a diet that is made up of local, fresh and seasonal veggies and fruits that are as colourful as the rainbow (think berries, apples, oranges, lemons, leafy greens, broccoli, red peppers—the more colour on your plate, the more vitamins and minerals!). It’s also a great idea to include fatty fish like salmon, lean meats, beans and legumes, nuts and seeds, eggs and even avocado to your diet. Enhance your immune with the right essential oils, many of which can help strengthen our response to those nasty bugs! How can I boost iron and protein in my diet and are there good vegetarian and vegan options? 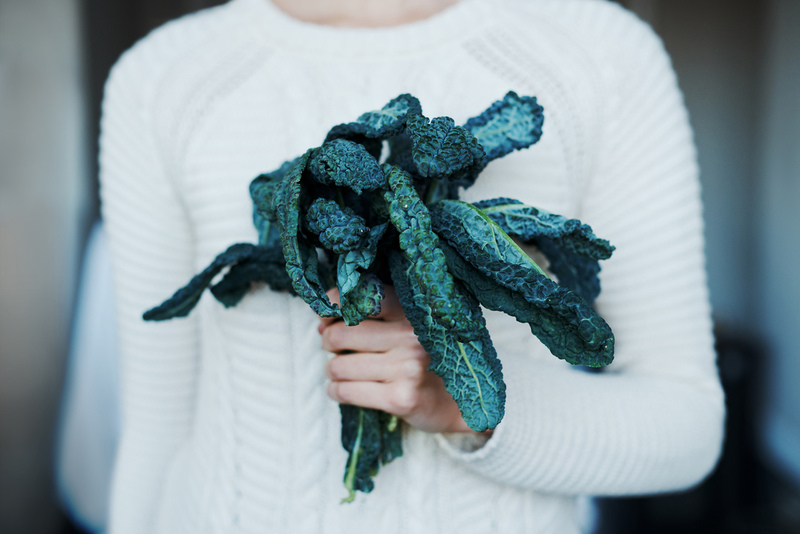 Iron is an important health topic as a deficiency can lead to us feeling down right awful. If you’re feeling this way, it’s important to visit your doctor and ask for a blood test to check your iron levels. Vegetarians, vegans (and those who limit their meat intake for other reasons), may be at an increased risk for iron-deficiency as meat is one of the richest sources in the diet. Thankfully there are many iron-rich foods that you can consume to keep those levels from falling. The best sources come from high quality red meats (preferably organic or grass-fed), fatty fish (think salmon) and seafood, dark green leafy veggies (spinach, kale, collard greens and brussels sprouts), beans and legumes (chickpeas, lentils, beans), tofu and tempeh, whole grains (brown rice and quinoa), oatmeal and a variety of nuts and seeds. The great news is that many of these foods also give the added bonus of increasing the protein in your diet! Our advice? Try adding some of these foods to you daily diet and we bet you’ll feel more energized and healthy in no time! Is it possible to eat well & healthy on a budget? Yes, we absolutely believe that it’s possible to eat well on a budget and we’ve got loads of tips to help you out with this. Although choosing organic is a great option—if it fits with your budget—we get it can be expensive for some. Our recommendation is to check out the ‘dirty dozen‘ and ‘clean 15‘ lists. 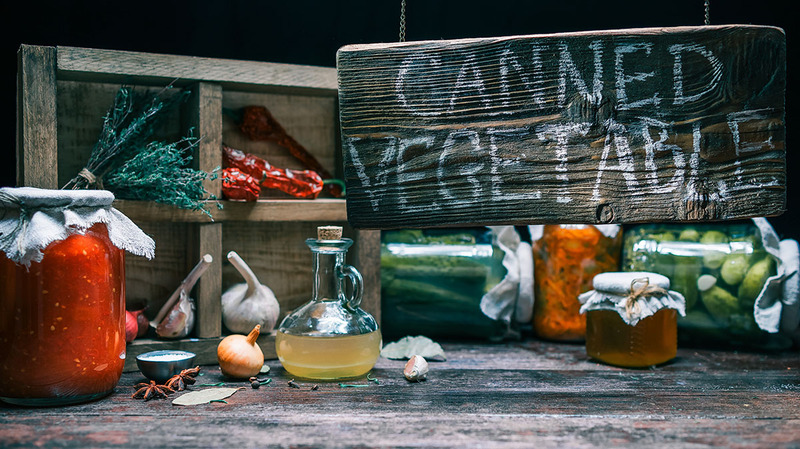 These two lists have been created to help people decipher which foods are better to choose organic (as they contain more pesticides) and which you are safe to buy conventional. Keeping a copy of these lists in your smart phone (or even in your purse!) can help you decide. Shop the perimeter of your grocery store. This is where the majority of whole unprocessed foods (think fresh fruits and veggies, lean meats, fish and proteins and healthy grains) are found. Stay organized! Each Sunday, sit down and make a weekly meal plan. Not only will this help to ensure you make most of your meals at home, but it can help you choose wisely and stay on top of your budget. During the spring, summer and even fall, take full advantage of your local farmers’ markets. 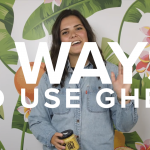 Here, you can stock up on local and organic fruits and veggies and save your bulk ingredients for a trip to a more expensive grocery store. Is fasting a good method for weight loss? Fasting is another buzz-word that’s on-trend these days. With this latest fad, we’re not talking about “Long Term Fasting”, rather something that has become known as “Intermittent Fasting”. There’s a big difference. We don’t recommend long term fasting (fasting for several days or weeks in a row) to lose weight or improve your level of health and wellness. We recommend eating a healthy and varied diet that consists of clean, whole and mostly unprocessed foods. When your diet consists of mostly fruits and vegetables, greens, healthy whole grains, healthy lean meats (organic and grass-fed are our preference), beans, nuts and seeds and healthy fats (EVOO and avocado for example), you will naturally move towards looking and feeling your best. The buzz-word “intermittent fasting” refers to a way of eating where you consume your food within a shorter time frame in the day; thereby leaving longer stretches without consuming any food. One example of this eating regime is consuming all of your food between the hours of noon and 8pm in a given day. Then, you would not consume anything again until noon the following day. Advocates of this method believe that it promotes an optimal metabolism as it gives your gut time to be empty; therefore your body relies on using your bodies’ energy stores. As with every trend, there are those who strongly believe in this and others who advocate differently. If you’re curious to learn more about intermittent fasting, we encourage you to seek advice from a professional who is experienced and start slowly. For example, 1-2 days a week, wake up and have a big glass of warm lemon water and then wait until noon until you have your first full meal of the day. Listen to your body and assess how you feel and you will learn if this method works for you. What is our favourite prenatal vitamin? We were both fortunate enough to have experienced two healthy pregnancies and two healthy babies. We were each plagued with a great deal of nausea during our first trimesters and tend to have tummies that are sensitive to taking too many vitamins at once, even when we’re not pregnant! So, it took a few attempts to find a brand that made us feel really good. 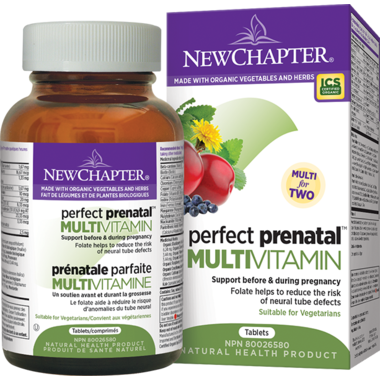 The brand we fell in love with is called New Chapter and it’s their Perfect Prenatal Vitamin. What we love most is that it’s a whole-food cultured multivitamin that uses organic vegetables and herbs. Once we started this multi, we said goodbye to our nausea and we felt great about what we were adding to our, and our babies, diets. What vitamins and minerals can help with thinning hair? A poor diet can affect the health of our scalp and hair. 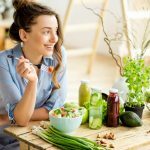 If you’re someone who has experienced thinning hair, or you just want vibrant and shiny looking hair, you can achieve this simply by making improvements to your diet. The benefits of consuming foods full of antioxidants are plenty, and healthy hair is top of the list. Eating a variety of different-coloured fruits and veggies (think green veggies, orange fruits and veggies and red berries) can help you achieve this. Other sources that are rich in B vitamins (which are very important for scalp health) are salmon, whole grains, brown rice, seaweed and green leafy greens. How can I ward off muscle cramps during and after yoga? Muscle cramps are actually very common (with higher rates in athletes and older people). And, although there can be many causes (dehydration being one of them), they are often due to an imbalance in minerals in our muscles. Magnesium is one of these minerals that is oh-so important as it helps to relax our muscles. So, if your body is deficient in magnesium, you may suffer from muscle cramps. One recommendation is to add a high quality magnesium supplement to your daily routine. It’s best to take this before bed as an added bonus is that it helps with sleep! We recommend taking 300-500 mg before bed and see how you feel. One of our fave products is Natural Calm Magnesium Citrate Powder, which can be found on Well.ca! 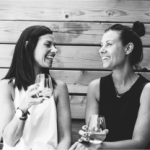 Lindsay Evans and Danielle McGrath are co-founders of Nourish Live Flow, a holistic health, and wellness company operating in Toronto and the GTA. They are integrative nutrition health coaches trained through the Institute for Integrative Nutrition and are currently in training to become meditation and mindfulness coaches. Their mission is to enhance the health and wellness of women, men, and children everywhere and empower people to take responsibility for their health and wellbeing. They whole-heartedly believe that reducing our toxic overload is essential in achieving optimal wellness. They have become ambassadors for 3 companies who share this belief, Beautycounter, dōTERRA and Juice Plus. Learn more about their health coaching practice at www.nourishliveflow.com. 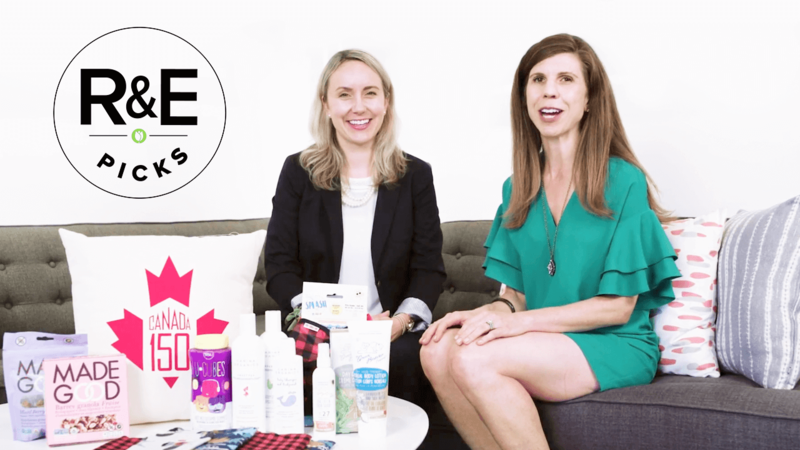 Rebecca & Erin's Picks Video Wellness Rebecca & Erin’s Fave Canadian Brands to Celebrate Canada 150!